Product prices and availability are accurate as of 2019-04-22 11:29:26 EDT and are subject to change. Any price and availability information displayed on http://www.amazon.com/ at the time of purchase will apply to the purchase of this product. Meet your business needs with this full-featured, affordable fax machine. Produce crisp, professional output every time, thanks to the laser technology. Use the auto document feeder to efficiently copy and send multiple pages. Store faxes for later transmission in the built-in memory. Reduce the time you spend reloading paper with the high-capacity, front-loading input tray. 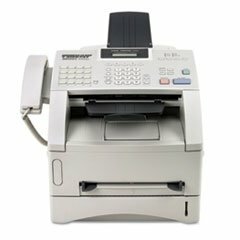 Gain the ability to use the fax machine as a printer by connecting it to your computer via the USB and parallel interfaces. Print Technology: Laser Maximum Print Speed Black: 15 ppm Network Ready: No.